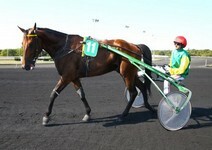 A brace of Group 1 races highlight the Vincennes Saturday card with a host of talent on view. First up is the Prix de l’Etoile which pits three year-olds against their older counterparts over 2200m, the younger generation receiving a not inconsequential 50m advantage. Five year-old Davidson Du Pont, who has been superb since his move to Jean-Michel Bazire, still looks to have the edge despite incurring the penalty. He secured his second top-flight win just two weeks ago and with shoes off again will take all the beating, but can expect to face stiff opposition from the Philippe Allaire-trained Fly With Us who trounced a good field to land the G.2 Prix Uranie on the same day. Julien Le Mer is confident about Fric Du Chene’s chances after his first-rate performance behind the excellent Fabulous Wood in the G.2 Prix Victor Régis recently. Others of note include Follow You and Django Riff. An hour later, a dozen will line up for the Prix de Normandie monté event over 3000m. The ultra-consistent Dexter Fromentro is expected to lead the charge, given how well he performed in the G.2 Prix Hervé Céran-Maillard on re-entry earlier in the month. Dubai D’Essarts had his measure that day but looks more a place chance over this trip. Principal threat to the favourite’s supremacy is the delicate but talented Durzie who had his measure during the spring. Dynasty Peji keeps progressing and with application can play an important role. Dryade Du Parc is not incapable of getting in on the action, and Duke Of Carless is another to keep an eye on.